The diverse wildlife and dramatic landscapes makes Kenya your ideal safari destination. This safari focuses on, national parks, mountain, forest, lakes and Game Reserves where wildlife is on display in landscapes of great beauty and variety and as you conclude your safari spoils yourselves with a homestay in some remote western Kenyan Lake Victoria where you will boil an egg in steamy jets. This is a great chance to spend quality time together with a family. On arrival at the Jomo Kenyatta International airport there will be transfer to The then already booked hotel for your overnight stay at a hotel. After, the day will be at your disposal with a possibility of booking any of the many excursions within Nairobi. Dinner on your own. Our safari representative will provide a safari briefing before you depart for Meru National Park. Meru National Park safari is ideal for guests looking for something off the-beaten-track and is well known for its bird life, riverine and forest as well as the dry arid species. Depart Nairobi in the Morning at 0800 Hours and drive to north to Meru National Park. We shall make a brief stop at Ogutu to see the Equator. We arrive in time for lunch, check-in to the campsite then relax before the evening game drive. We spend a full day in the Meru National Park on morning and afternoon game drive. Meru wildlife includes large herds of Buffalo, Bushbuck, Duiker, Eland, Elephant, Gazelle, Genet, Giraffe, Hartebeest, Impala, Kudu, Waterbuck and Gravy Zebra. Expect to see Baboons, Hyena, Jackal, Kudu, Lion, Mongoose, Oryx, Oribi, Vervet Monkeys and Warthog. You may see Wild dog, Bush baby, Caracal, Cheetah, Civet, Dik-dik, Leopard, Otter, Bush pig, Porcupine, Black and White Rhino. and Ura Rivers, the Pel's Fishing Owl, Kingfishers, Rollers, Bee-eaters, Starlings and numerous Weavers. Depart after breakfast and proceed across the Kenyan Highlands, through pineapple and coffee plantations, to your "base hotel" in time for lunch at the Mountain Rock. Dinner and overnight at a hotel or lodge. Today you will wake up very early in the morning for early breakfast, thereafter you will take you be driven to the Hells Gate National Park for cycling within the famous park full of volcanic activities and the beautiful cliffs. Hells Gate National Park is famous for its cycling and hiking safaris, you will be surprise to cycle between the wildlife and the nature. You will cycle to and back at the starting point. You will return to the lodge to take your luggage then you will be driven to lake Nakuru for lunch at the Fisherman’s Camp. After lunch depart for the game drive in the park, in search for the big five animals i.e. lions, rhinos, leopard and cheetah and more other animals. Lake Nakuru is famous for its millions of flamigoes and immigrate birds from over the world, in Nakuru we have upto 425 different species of birds. You will leave back to the Camp before dark for your dinner and overnight. 7.30pm. Dinner and overnight at a Hotel or camp. Lake Nakuru National Park is referred to as the "the greatest ornithological spectacle in the world" with both Lesser and the Greater Flamingoes sometimes exceeding 1.5 million individuals. The alkaline habitat supports thousands of resident and migratory waterfowl. The alkaline lake, acacia woodland, grassland, rivers and inlets with marshes hold over the 450 species. Dinner and overnight at a Camp in Baringo. Lon this day you will get the opportunity to visit Lake Bogoria for the steaming jets /geysers and also get the opportunity to visit typical villages around that place. After breakfast, drive to Kakamega National Reserve. This is the country's only tropical rain forest and formed part f the dense rain forest that stretched from West Africa, across central Africa and in to the highland areas East and West of the great rift valley. The forest is world renowned as home to several hundred species of birds including rare snake eating birds, insects, monkey and other mammals as well as countless exotic tree species. Dinner and overnight at the Kakamega Forest Campsite. After breakfast, spend a full day in the Kakamega National Reserve with bird walks accompanied by game wardens and our driver/guides. Dinner and overnight at the Kakamega Forest Camp site (FB). Dinner and overnight at a guest House on Bed and breakfast (BB). Depart from Kisumu after early breakfast by road passing through Kendu Bay and Homa bay town to Ruma National Park through Nyatoto gate with en-route game drive to our accommodation for lunch. After lunch, you will embark on an extensive game drive. Ruma National park lies in Western Kenya, close to the shores of Africa’s largest inland Lake, Lake Victoria. The park is considered the last retreat and the sanctuary of the endangered and threatened Roan antelope which is considered one of the Africa’s rarest Antelopes. This park was established in 1966 to protect its indigenous population of rare Roan antelope which exist nowhere else in Kenya. It acquired national park status in 1993 and renamed Ruma National Park on the request of the local community in honor of one of the most powerful Kenya’s wizards, the much-feared Gor Mahia who was living high on a hill which now forms part of the Kanyamwa Escarpment. The classic image of East Africa is realized in Ruma National Park, a land of rolling Savannah dotted with picturesque Acacias and backed by dramatic hills. Compact in size, the park is easily traversed by only two major routes and offers a unique mosaic of reverie woodland, golden Savannah and magnificent Escarpments. Well away from the beaten tourist track and relatively infrequently visited, it is also a park that excels in tranquility and the solitary enjoyment of the wilderness. Apart from the Roan antelope,we have also plenty of African Buffalo (the only native African cow) it is believed that Ruma National Park was the origin of almost all the animals found in Maasai Mara which were driven away by the Luo community, who are farmers and animal hunters by nature, through Migori, Lolgorien and into Maasai Mara. To prove this, keenly you could check the African Buffalo in Ruma National park with the normal Buffalos you can see in Maasai Mara are quiet different and more so, the Buffalos in Ruma National park are very Wild and have wide horns with very hard and big forehead which were protecting them from the bullets, arrows and spears of the hunters hence they remained behind. The park also act as a home to the common waterbuck, the Aardvark, the honey badger, the solitary nocturnal African civet, Serval, Genet, Topi, Impala, Vervet Monkey, Olive Baboon and at night you can hear the sound of the secretive Leopard and the common sound of the spotted Hyena which will give you the memorable sound of African bush. Return to Your accommodation in the evening for Dinner and an overnight stay. An early morning breakfast then depart after breakfast back to Rusinga Island for a tour around the Island. Rusinga is an austerely pretty Island with high crags dominating the desolate goat-grazed landscape. A single dirt road is running around its circumference. Life here is difficult, drought commonplace, and high winds a frequent torment. The occasional heavy rain either washes away the soil or sinks into the porous rock, emerging lower down where it creates swamps. Ecologically, the Island is in very dire straits: almost all its trees have been cut down for cooking fuel or been converted into lucrative charcoal. Drive brings you to Tom Mboya’s mausoleum which lies on family land at Kamasengere on the north side of the island, about 7km by the dirt road from Mbita, or roughly 5km directly across the island. The mausoleum (open most days to visitors) contains various momentoes and gifts Mboya received during his life. Tom Mboya, civil rights champion, trade unionist and charismatic young Luo politician who was gunned down in Nairobi in 1969, sparking off a crisis that led to over forty deaths in widespread rioting and demonstrations. Packed Lunch at a convenient place in the Island, then drive to catch the 3pm Ferry to Lwanda K’Otieno. Pass through Akala market which is famous for cattle sale in the whole of Nyanza region to get to learn after interacting with both sellers and buyers, the tricks and preservation of this old traditional trade which is attracting buyers and sellers as far as Kisii, Migori, Kadem, Karungu, Kanyamwa, Gem, Alego e.t.c. 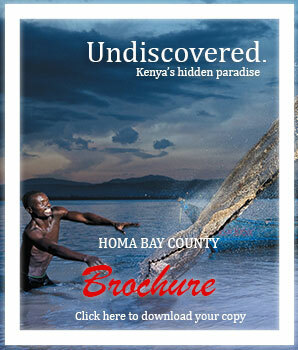 We drive back to Homa Bay for your overnight stay. Late breakfast then depart for Masai Mara via Kisii arriving in the late afternoon. Drive to your accommodation for dinner and overnight. Masai Mara Game Reserve is a plain of rolling grassland dotted with a mixture of acacia trees and the plain game which includes large herds of Elephants, Zebras, Topis, Hartebeests, gazelles, Impala's not forgetting the well known Mara/ Serengeti Wildebeest's migration, Lions, Cheetah among other cats. We'll spend sometime in the afternoon to visit the Masai Village for a cultural dance and experience their way of life. Return for dinner at the same accommodation. Breakfast then go for en route game drive on our way to Nairobi while searching for more bird species especially the Magpie Shrike and others on the eastern part of the reserve. While on the way to Nairobi we'll stop in search of the Swallow-tailed Kite. Early breakfast then depart for the airport to connect your flight back home. “These rates are inclusive of current levies & taxes as of today. Flight fare is current and subject to change without prior notice. This is beyond our control and any increase levied will be passed to you. Baggage on internal flights is strictly limited to 15kgs per person (including hand luggage. Any excess baggage will be charged by the airline at check-in.